Los Angeles artist Oscar Tuazon created a site specific model, "Model Mother," at The Brant Foundation Art Study Center, where other pieces of his work are on display at the Greenwich, Connecticut, center through October 2018. On Aug. 10, 2018, Urs Fischer's sculpture "Big Clay" rises in the distance. Allison Brant peers into the passageway as she encourages a visitor to do the same. A mini labyrinth of corridors, it is created by large recycled thermoplastic tubes, a nod to many such structures around the world that shepherd a most precious resource. His works, such as “Une colonne d’eau — Life Prototype,” which dominates one of the center’s galleries, are as much about aesthetics as they are about activism, in the sense of raising awareness about the world’s resources and sustainability. Brant realizes there is limited time in the tour, but encourages her guest to do independent research about the work of this Los Angeles artist. Her knowledge of Tuazon is as deep as her understanding of the other two artists in the show, fellow American artists Joe Bradley and Michael Williams, who primarily draw and paint. It delights her to share the inspirations and stories behind their works, which she does for every tour. Brant, the center’s director, is the embodiment of what her father Peter Brant, a publishing and newsprint executive, set out to do when the opened the center in 2009. 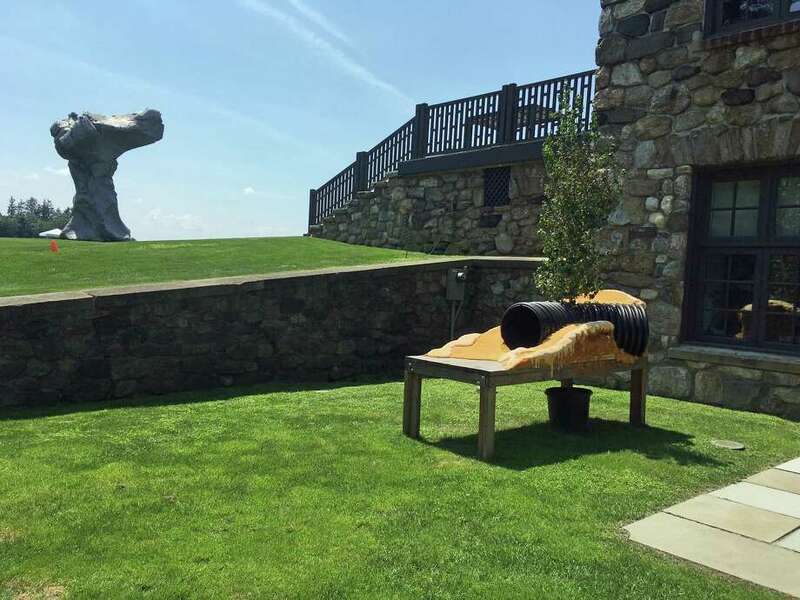 By creating the space in north Greenwich — in a former stone barn that once served as cold storage for fruit from area orchards — pieces of his art have become more accessible to those new to contemporary art, as well as seasoned scholars, who, perhaps, gain a better understanding of those who are making it and their import in the timeline of art history. As it nears its 10th anniversary, Allison Brant is looking to the future with an eye to the past. Unable to pick a favorite show, she does love how artists are encouraged to transform the space, or use it to express a particular journey. In the latest show, there is a through line starting with the inception of creativity, in the center’s library and study room. There are maquettes of Tuazon’s sculptures and early drawings from Bradley and sketches from Williams that inform the large-scale paintings one finds further along in the space. The shows provide the fuel to move the center and Brant forward, who has a deep affinity for the “study” part of the center’s name. For instance, the center has tapped the themes of the present exhibition to guide events that foster artistic expression among all ages. In June, artists were encouraged to use the landscape (the center looks out onto the Greenwich Polo Club grounds) as inspiration for abstract work, as Bradley did early on in his career. Tuazon’s sculpture was the starting point for a children’s workshop on handmade bird feeders. Of particular satisfaction is watching as visitors make personal connections to the work. Is that the sun, a boat in one of Bradley’s colorful, large works? Before there are any personal revelations, of course, one needs to know the art is there in the first place. Part of the center’s mission is to ensure local audiences know about this cosmopolitan gem tucked into a pastoral setting. The center is open to the public Monday to Friday, as long as they sign up in advance for an appointment. Its scholarly holdings should soon be even easier to share, as well, given it has begun a cataloguing project of its more than 12,000 books, catalogs, periodicals and other material — something that would have been a boon to Brant as a college student while studying art. “I used to have to come home all the time to do research,” she says, laughing. Brant also is hopeful that, come the fall, the center will have Saturday hours for visitors coming to see the work of the next show on Francesco Clemente.